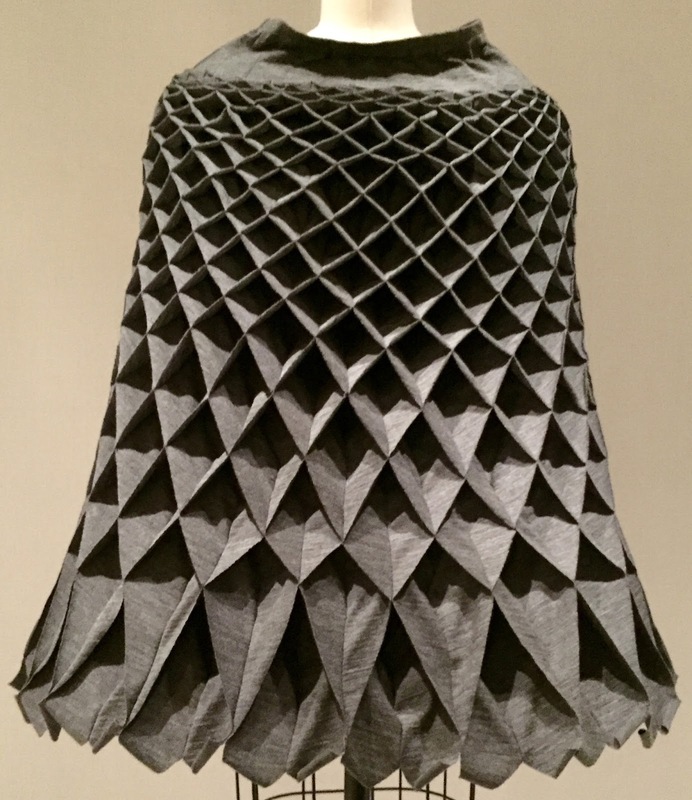 If you like the many faces of fabric, get thee to the Met before The Costume Institute's spring 2016 exhibition, Manus x Machina: Fashion in an Age of Technology closes because it's a stunner. The show is full of beautiful objects, but its focus is on how fashion designers have embraced machines and technology to create new works. Almost all designs are from the early 20th century to the present. The exception is an 1870 Irish crocheted wedding dress. 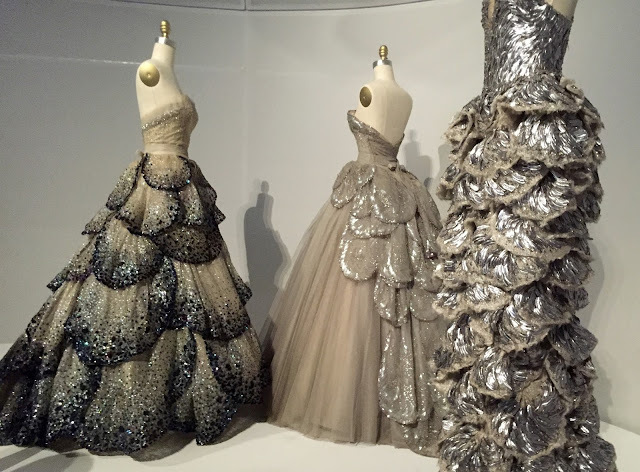 Ranging from haute couture to prêt-à-porter, some of the works are very avant-garde--and barely wearable. Like the cast fiberglass 'statement' dress that releases maple-seed-like elements by remote control. But the majority of the 170 ensembles are not only very wearable, but elegant and timeless. Iris van Herpen dress, 2013-14. Dutch designer Iris van Herben's haute couture dresses stand out as examples of harnessed technology--and you don't need to like them to appreciate their creativity. 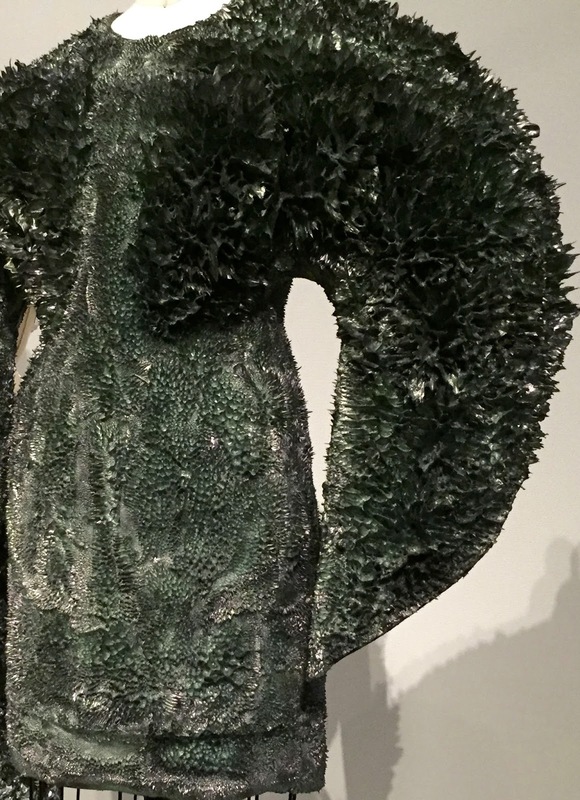 One of her dresses was made of 3-D printed epoxy, sanded and hand-sprayed. Another van Herben dress (at left) is strangely dark and highly textured. Its fabrication, fascinating. Cotton twill fabrics was hand-painted with polyurethane resin and iron filings, then hand-sculpted with magnets. Another dramatic haute couture dress by British designer Gareth Pugh was machine-sewn white sold-wool gazer with an overlay of white mesh and hand-embroidered with clear plastic drinking straws. Prefer one in black? He has one of those, too. 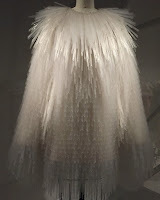 I almost had visual overload on the many ways feathers were incorporated into dresses and capes. One Alexander McQueen ensemble (2014-15) is covered with embroidered ostrich and goose feathers. And how about pleats? It's hard to outdo Spanish designer Mariano Fortuny for pleats and, yes there are several of his classics to behold. 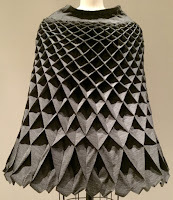 For modern interpretation, I was taken with the contemporary (2015-16) cape of machine-sewn gray wool and polyurethane jersey by Japanese designer Junya Watanabe. 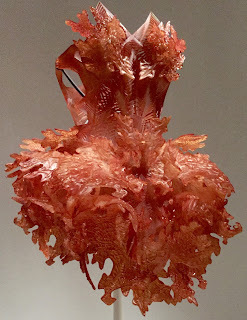 Hussein Chalayan, "Duck dress." 2000. Scissors are always at hand, but not in the way British designer Hussein Chalayan used them to create his prêt-à-porter "Duck" dress. He cut away shapeless bales of pink tulle fabric by hand until he had a female shape. Kind of like shaping boxwood hedges, I guess. There is much, much more. If you can't get to the exhibition, consider purchasing the Manus x Machina catalog. And here are a few more dresses that I found particularly stunning. L-R: Irish crochet wedding dress, 1870. Paul Poiret.Coat-wool, leather. c.1919. Such beautiful pieces. I would love to check this out. And i really like how you explained everything so well. It was such an interesting read. Thanks! The Met has digitized many of their collections and made them available online. You might check to see if this one is--and if not this one, surely you'll find others that you like!